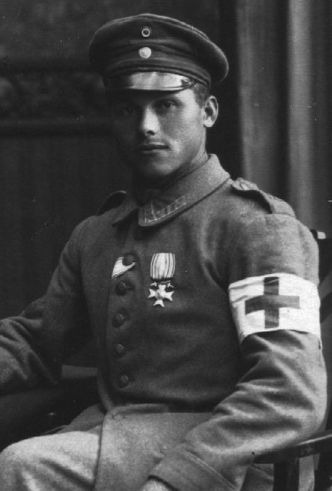 Wilhelm Michael Schneider (writing as "Wilhelm Michael") in his book "Infantrist Perhobstler : With Bavarian Divisions in the World War" vividly describes the fate of a soldier trapped between the lines. "At noon the fog lifted. At about 2:00 PM Johannes Hofmann comes to me. "There is a wounded Scotsman in front of the trench." He says. It is true, there is someone sobbing out there, amongst the dead a man is crying. I feel a cold shudder... "Which one is it?" I ask myself. I stand on the fire ledge and carefully look over the top. As soon as I raise my head a shot sounds and a bullet hits the sand behind my head. The British are firing at me. I become excited, something like this did not happen often. From behind the shield there was not much to see, through the slit I can only see 2 dead men and a bit of the British trenchline. One of the dead was missing his head, it has been hit by some of the many the bullets fired at random at night. The other man has the bones of his feet exposed, the flesh has been eaten by rats. It could not be either of them. I call out in broken English and ask if the man is a wounded Engländer. I ask where he is laying, and he says between the two bodies. 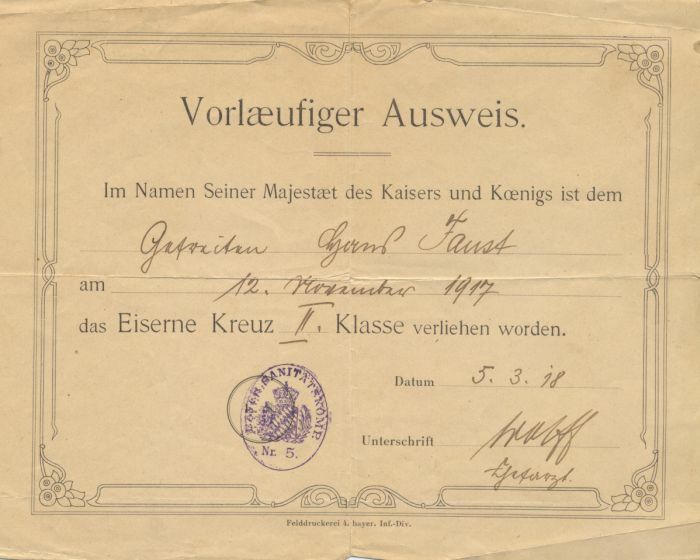 Above: The Iron Cross 2nd class award document to Gefreiter Hans Faust of the 5th bayerische Sanitätskompanie of the 4th Bavarian Infantry Division which spent most of 1917 in Flanders. Adam Kirsch runs up with a trench periscope. I look over the top and say "Comrade, move your arm a bit so I can see you!" It is true, between the bodies an arm lifts itself painfully. He is not more than 10 meters away. He is just in front of the shooting shield, but is protected because he is laying out of sight in a bit of dead ground. We tie some groundsheets together and throw out the rope. The Scot holds on and we pull slowly. He cries and screams. the attack had been 9 days ago! He has been laying there for 9 days and 9 nights. I carry the young Scot in my arms like a child, he does not weigh more than 100 pounds anymore. His face is black, just some grey-white dirt under the eyes as you often see on dirty children who have been crying. Only here the crying has been for something more serious than those kids would be able to imagine. We quickly cook some tea, four or five of us fussing over our findling. I tell them to put no sugar in the tea, his stomach will not be able to handle it. He drinks greedily. It is odd for an Englishman to appreciate German tea, but that thought does not occur to us. The young man has been shot through the thigh. After the tea he is content and begins to speak to us but I do not understand most of it. Adam washes his face but the dirt stays put. The leg looks bad, it is blue and black, although under usual circumstances it would not have been a dramatic wound. A simple flesh wound, a little bone damage... it would have been his ticket home. 9 days and nights he lay there. During the day he played dead, and at night tried to crawl back. Initially he had been to scared to move, then unable to move, each effort causing him to cry out in pain. We pack him in a shelter half. He is a young Scot. Not what we imagined a Scot to be, with their swirling kilts and wailing bagpipes. It was the first time we had had anything to do with one. He was a recruit and had been afraid of us. We were "Huns" according to their newspapers. He pulls a newspaper cutting from his pocket with the title "Ready for the Huns! ", it showed a long line of Scots soldiers and he points to one "That’s me..."
"Its over for me" he says without emotion. A Frenchman would have cursed and fumed but the young Scot is resigned to his fate. He gives me his bible, as a souvenir. He has nothing else, it is his most valuable possession. His sister would not mind, she had written a dedication in it before he had left for the front, now he wants me to have it, maybe it will protect me. 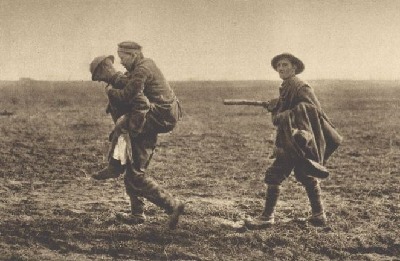 Then two men carry him to the rear. 9 days and 9 nights in Nomans land, to scared to move because of a newspaper article. It had taken so long for him to make contact. His leg had to become blue and black before he felt he should risk calling to us... The newspaper was the sickness that killed him. When my men bring him to the rear the doctor just shakes his head. The poor lad remains a vivid memory....."
"We had foxholes about 1 meter deep. The heavy shells made holes 3 or 4 meters deep. They threw us onto the open ground and destroy the positions we had made that night. Shrapnel flew around us. From all directions they shot at us, hundreds of cannons at one regiment. Emile fell down dead next to me, he jerked a few times. I lay still next to him, unable to think. I was waiting for my turn. I did not think that consciously, but just waited for the end. What else was I supposed to wait for? A Miracle? To get out of there would take a miracle. I did not raise my head out of the foxhole, not once that night. I was alone with my dead comrades, holding my spade over my head to protect me from shrapnel balls. The sun began to shine, early in the morning, hanging motionless in the sky. Earth rained down on me now and again and every so often I stretched my legs to see if they were whole. My body was cold. The sun still hung life less in the sky.. why did it not warm me? Was I dead? No! No! Suddenly I heard a voice screaming, a wounded man is screaming. It is the only thing I heard that day other than whizzes and bangs. All around was a sea of explosions in which I was slowly drowning, waiting for a shark to take my legs off. That evening the fire died down. Stars began to blink. I climbed out of my hole to look for a rifle. I stumbled over the dead and wounded. Rifle shots sounded out as did a machine gun, but after the days artillery it was like a kids game. I didn't give a damn. Suddenly my luck ran out... I barely felt it, something jerked on my left leg. I reached down and found my hand covered in a sticky fluid. I threw down my equipment and spade and made my way to the rear. I had cursed a lot by the time I had found the right way. I reached the Verbandstube of the regiment... many dying men were laying there. Two doctors and their helpers were at work, efficient and professional. They were very calm and unemotional, but I think if we had all come, those carrying their heads under their arms, those with their shot through hearts in their hands, or those with their ripped off legs slung over their shoulders... I think then, these efficient handworkers would have run away, and we, we would have watched them run with astonished looks on our faces......"